Burning City – A new map of international modernism and poetry: Cineland, Music Hall, Electric Man.. 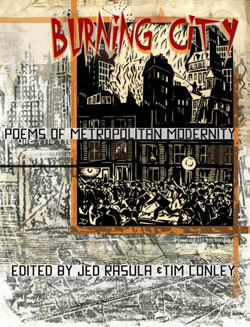 Burning City: Poems of Metropolitan Modernity, Edited by Jed Rasula and Tim Conley, Action Books, 2012. "BURNING CITY acts as a "multisensory Baedecker" to the many incarnations of international modernism from 1910-1939. Inspired by the abandoned plans of the early avant-garde poet Yvan Goll to write a history of modernity through the poetry of that era, scholars Jed Rasula and Tim Conley have carried out Goll's project, scouring the small journals and magazines of the period for both lost and seminal texts. BURNING CITY is organized not just according to the cities which inspired the texts—Paris, Cracow, Buenos Aires, and so on—but according to such icons of the modern urban experience as "Cineland," "Music Hall," "Electric Man." BURNING CITY makes a new contribution to anthologies of both poetry and modernism by its thematic focus on city life, by its inclusion of poets from languages and nationalities seldom represented in standard US surveys, and by its preservation of the typographic versatility of the this feverishly innovating period."